We noted that the reading materials offer valuable insights both to ANT experts and to those who have only discovered it recently. Our first text involves a Socratic dialogue between a professor and a PhD student (Latour 2005). The student asks many questions as for how to apply ANT, only to receive rather elusive responses such as ANT is only useful when it is not applied to anything. It is a strange but consistent text that may provoke strong feelings as it demonstrates the several notable clashes between ANT and other approaches to research. ANT is unique in many ways. In our second text, Lehtonen (2000) presents ANT’s key concepts and analyzes ANT’s insights regarding collectives based on Latour’s three texts: “Les Microbes: guerre et paix”; “Aramis ou l’amour des techniques”; and “Paris ville invisible”. The discussion of TSElosophers concentrated mostly on ANT’s key concepts, because ANT seems to be extremely difficult to pin down. This is not only due to Latour’s cryptic writing style, but also as his ANT seems to be also a somewhat ‘moving target’: Latour’s own views on ANT seem to have developed over time, too. Latour has even criticized the name he gave to it: ‘actor’ is a too strong expression, ‘network’ is often misunderstood and ANT is actually an ontology (e.g. Latour 2005, 9). Actor-network theory defines actors as things which have an effect. A network in ANT is not a safely stable network formed by ostensively defined actors, but very dynamically appearing and disappearing network of performatively defined actors having effects. One in our group with experience on Deleuze and Guattari noted a similarity between the idea of network in ANT and rhizomes, both differing from the more traditional ideas of networks. Also, renaming ANT as an ontology fits with its anti-essentialist, a-theoretical approach. Anti-essentialist approach provides a strong contrast to traditional sociology. The anti-essentialism of ANT denies that any properties of objects are results of their essence. Rather, in ANT, all properties are viewed as relational outcomes of the actor-network. A stability of a network can emerge and Latour calls these ‘black boxes’, but these black boxes are contingent on the ‘network’ of the actors. Black box, e.g. the election results, can become a new actor that affects the creation of other actors, such as a new government. If, however, an election fraud was uncovered, the election results could become questionable, suddenly destabilizing the network so that it would no longer be a black box. This would make, for instance, the forming of a new government difficult. Latour’s interest lies in the detailed descriptions as for how black boxes are formed and kept up, whereas traditional sociology usually just analyzes these black boxes, e.g. theorizing on democracy. Latour emphasizes that in his approach the researcher doesn’t have to pretend – actually he is not allowed to pretend – to be wiser than the studied actors; he encourages the employers of ANT be happy with just building empirical descriptions and possibly giving these back to the explored actors for reflection. We were puzzled by the ANT’s seemingly strong commitment to an a-theoretical approach and its possible implications. If Latour was taken completely to his letter, ANT cannot be applied to anything, because it does not provide much theory and it is incompatible with using other theoretical framings. We considered whether it actually is possible (even if one so wished) to employ a categorically a-theoretical approach in research and if so how. We felt that writing a fully and only descriptive research text on actors creating new actors remains a very problematic endeavor: For instance, how to find proper mentoring support and how to present the findings so that they could be found persuasive and interesting for practitioners and funders, leading to publications? We were left wondering why exactly could theory that the researcher would like to employ be not used in an ANT-based research, being hence understood like any actor in ANT (an entity having effects) and treated like theories are typically treated: Having a focusing and a limiting effect simultaneously. We concluded that ANT was a worthy actor in our meeting. There were many suggestions as for how to continue looking into ANT in particular and the anti-essentialist tradition in general. One of us suggested taking a good look at Harman’s (2009) “Prince of Networks”, which provides a most insightful analysis of the ontology of ANT. Others aim to look into anti-essentialism (e.g. Fuchs 2001), develop their understanding on the differences between ANT and Deleuze & Guattari, or read Latour’s “Science in action” (1987) and “Reassembling the Social” (2005) entirely. Regarding the a-theoretical nature of ANT, the piece by Modell, Vinnari and Lukka (2017), published in “Accounting, Organizations and Society”, could be useful reading. Darier, E. (1999). Foucault and the environment: An introduction. Discourses of the Environment, 1-33. Of which ”The Three Foucaults” pages 8-27. In the piece of text we chose this time, Eric Darier, a Canadian political scientist having a deep interest in environmental issues, is looking at intellectual contributions of Foucault’s life dividing them into three periods: 1) an archaeological approach to scientific discourse and knowledge, 2) a genealogical approach to analysing social practices, and 3) ethical considerations of the possible conditions for the creation of self by itself. In addition to examining the influential ideas of these periods, Darier masterfully follows the development of Foucault’s thinking by linking the ideas and themes arising in Foucault’s earlier works to his later writings and vice versa. Furthermore, following the theme of the book, Foucault’s ideas are examined for their possible applicability to environmental issues. • In Foucault’s archaeological approach, knowledge is relative to the historical context from which it emerges. Focus is on the emic statements of ‘objective reality’, scientific discourses, and how objects of scientific investigation emerge. Historicity of all of knowledge is emphasised. Foucault’s archaeology has been critiqued e.g. for being actually quite structural in approach despite his own criticism of structuralism; and for focusing on ideal knowledge categories and ignoring social and power relations. • Genealogical period is partly Foucault’s attempt to respond to prior criticisms. Foucault’s genealogy tries to spot different roles the ideas take, fragment and deconstruct something that is considered stable. This adds on archaeological approach by introducing a broader context of social practices and the concept of power. Foucault here defines power partly through negation; power being relational, diffused, and having normalising effects; power being both positive and repressing, constitutive and enabling. Foucault is suspicious of what he calls ‘teleological projects’ and warns against ignoring the dark side of any projects propagated as ‘liberation’. • The final Foucault focused on Greek ethics and explores, in particular, how individuals can sometimes, after all, construct themselves and their conduct in the world through ‘practices of liberation’ in relative autonomy from normalisation process. • For the environmental discussion, an archaeological approach can help us see and reflect how environmental claims are made, or risks constructed, and by doing so resist the ‘fundamentalist temptation’ and reductionism. Genealogical period, in turn, introduces concepts that are very useful for environmental discussion: governmentality, biopolitics and space. Governmentality deals with issues of security, techniques to control the population and new forms of knowledge. Biopolitics concerns with power relations in governing life: population’s health, hygiene, natality, longevity etc. Space refers to government’s control over population living in the territory rather than a territory itself. Finally, Foucault’s last period is important for environmental ethics, where the idea of relatively independent self-constitution means that humans have the potential to continuously rework their relationship with themselves and their environment. The discussion started with the question on the differences between archaeological and genealogical approach, or, more precisely, on the differences between the two analogies. How archaeological analogy differs from genealogical, if both are still emphasising the historicity of knowledge, among other things? We discussed that these two periods probably have the same goal, but present a shift in approach as well as response to several critiques as Foucault’s thinking developed. While archaeological approach can be compared to digging down through historical levels to uncover the roots of knowledge and scientific discourse in relation to historical contexts, genealogical approach looks at the ancestry of ideas, the situational connections between concepts as part of human practices. Though also partly historical, genealogical approach focuses more on fragmenting or unstabilizing the concepts that are considered historically stable, looking at how and through what power relations different elements of the concepts have been normalised. The discussion then touched Foucault personally and his constant struggle against normalisation. An observation was expressed that his writings might actually reflect a certain kind of process of ‘autopsychoanalysis’. Through Foucault’s works, one can imagine him processing, for instance, his own sexuality (he was at least after some point of time openly homosexual) in his continuous fighting back established power relations, pressures for normalisation, and, especially in his later writings, pondering the development of the self in the context of these relations. Everybody agreed that Foucault’s profound analysis of power relations is very useful and can be applied to many contexts. It is also in a way an optimistic, or at least less deterministic, approach, as power is seen operating through dispersed networks or dispositifs, which enables the resistance to take place at the multiple points of contact with this power. We also discussed certain pre-arrangements that are required for something or somebody to have power. For example, the tools for measuring the degree of somebody’s healthy lifestyle will govern one’s behaviour only if one sees the value in exercising healthy lifestyle. One of us noted being himself typically very sensitive and critical towards the new and again new teleological projects typical of bureaucracies, for instance, leading us often all too easily to just accept our participation in processes of normalisation; at least today, people have a tendency to switch their mode of self-governance on rather easily, without much reflective critique. The conversation then turned to the environmental issues and the points Darier makes about applying Foucault’s thinking to the current (at the time) environmental discourse. Darier mentions that Foucault’s ideas of biopolitics and biopower have been extended to cover ecopolitics. While Foucault’s biopolitics is concerned with administration of populations by exerting positive influence on life, current environmental issues put a twist on the idea and make us consider other forms of life than human populations, namely, environment at large. Darier was of the opinion that Foucault would criticise ecocentric (anti-anthropocentric) views for ignoring the fact that they are constructed by humans, which leaves us with a problem of how legitimate is the human voice speaking ‘in the name of nature’. Following up on this thought, even though discussion on anthropocentricism was not really on the agenda of this session of TSElosophers, we wondered whether Foucault’s view might have been too anthropocentric, thereby being as much a ‘child of his time’ as anybody else: During his time, the scenario of the global ecocatastrophe, and the role of humans in getting it happen, looked certainly a significantly more distant and less likely one than how we perceive it now. Another theme, arising mainly from the final Foucault period, is the concerns on how people develop sustainable identities relatively autonomously from normalization processes, for instance, in the context of the (at that time) emerging program of ‘new ecopolitics’ and its new power relations. The discussion on environment continued taking a bit more extreme turns. While Foucault argued against extremes and for self-reflecting understanding, some of us suggested that we are now living a time where radical extremes might be necessary, not least due to the ever increasing likelihood of global ecocatastrophe. The chapter is written in 1999, and Foucault himself wrote in 1960’s–80’s, which begs the question whether new insights into the very serious environmental issues would require a new, different perspective to the environmental critique? Is it viable to just routinely resist e.g. the normalisation of environmental discourse in case of existential threat at the global level, if the other likely option were a full chaos, even everybody’s war against everybody else? Indeed, appealing to security issues is one of the main components of governmentality, but the typical Foucauldian approach of viewing them always as just another teleological project, on which we should by default fight back, might in such very different conditions – under drastically new global ‘rules of the game’ – could well be viewed as less warranted. We continued discussing individual’s personal choice of something being normalized for the better of the society. The topic flowed into discussion on having to make trade-offs to achieve something collectively, which means taking both the good and the bad that comes with it. The bad would mean giving up some freedom, as the only way to be completely free is to be alone. The discussion ended with the topic of personal ethics under existential threat, not living up to your ethics, and not being able to act autonomously from normalisation of practices that are against your ethics but beneficial of the survival of oneself or one’s kin. TSElosophers’ overall impression of the text was positive: for some, Darier’s analysis brought new understanding of Foucault’s works in the context of his life, while for others the main interest lied in the environmental discussion and how ideas presented in 1999 would look today. In addition, during the discussions there were several recommendations for further reading: Ari Ahonen’s thesis on Foucault (Liikkeenjohdollinen tieto ja disiplinäärinen valta: tutkielma Michel Foucault’n ajattelun relevanssista johtamis-ja organisaatiotutkimuksen kannalta, 1997), Donna Haraway’s Primate visions: Gender, race, and nature in the world of modern science (available in Google Scholar), and research in accounting on governmentality, for instance the article “Accounting and the construction of the governable person” published in Accounting, Organizations and Society in 1987. For additional Sci-fi readings, please contact Milla. Shoshana Zuboff draws the contours of the emerging phenomenon she dubs surveillance capitalism. Its building blocks are datafication and extraction and analysis of that data, ultimately transforming the everyday lived human reality into behavior, which can be through Big Data and algorithmic analysis harvested and capitalized. She walks the reader through a set of quotes by Hal Varian from Google, to highlight how the digital technology becomes Big Other amplifying the reach of capitalism to yet another level. The overall sentiment towards the article was that it addresses and captures a genuinely powerful and worrying phenomenon, which, if left unchecked, will lead to quite a dystopian future. Some of us feared the dystopia more than others. Firstly, it was pointed out that the imperfections of technology will likely hinder the efficiency of Big Other and therefore the behavioral predictions of Zuboff are still far from overarchingly accurate (however it was retorted that the technology does not need to be perfect, just strong enough to wreak havoc). Secondly, some of the insights discuss such technological affordances still quite nascent as done deals (like the use of smart contracts in automatically shutting down a car driven ‘wrong’). Thirdly, some of the arguments rely on such research results which have subsequently been found unconvincing: for example, teenagers are not unaware of the privacy loss, and their continued use is not reflective of ignorance, but of wittingly made strategic choices of transforming privacy into currency. Those of us who saw the article as foreboding a dystopian future (if not already present), the most difficult question was to define what then would be better? For whom, from what perspective, and why? If my hunger was satisfied before I even acknowledged it (or if my kids were automatically provided food whenever necessary without me needing to bother cooking it), why would it be so terrible? If I were given whatever I needed and wanted in exchange for being a data source, would it really be that unbearable? The answer to this seemed to boil down to the question of free will, our values and preferences about the nature and quality of life. One of the traditionally considered basic human rights is liberty, and marketizing behavior threatens that, because it is grounded on a set of choices I cannot make for myself: Firstly, I am used as a data source without my (at least witting or informed) consent, and secondly, my behavior is deducted and monetized from this data without my consent. There may be limited options for opting out (the free will can be used in choosing what to do with the food magically appearing by my door), but there are none to predictively choose to not to opt in. However, we also noted that as the convenience level of life increases through involuntary participation in surveillance capitalism as the source of data and target of need satisfaction, the mere abstract notion of free will is not enough to make people-turned-consumers rebel against the emerging system, driven by the agents in the behavior markets. When life is just made easier, why bother? We also discussed the power of politics. While technology always moves faster than legislation, what kind of power does the political system have in regulating the developmental trajectories, and on what is that power based on? This also led us to discussing the loci of political power; whether it will still be wielded by nation-states, or something else? Here one of us quipped that “at least so far it is the nations that still have the guns”, inferring that the states still possess a level of ultimate power over companies. Additionally, the different political choices made in the US, Europe and China were also discussed: Where the Europeans worry about the human rights (such as privacy and to an extent freedom) and legislate accordingly, the Chinese opt for technological prowess which mandates nonchalance in regards to these. The ensuing trade-offs will play out in the long run. The fate of trust was also pondered. Zuboff states that automatic fulfillment of contracts leads to disappearance of trust, which is grounded on the choice to trust or not. It was pointed out that maybe the trust is not removed but retargeted: Instead of trust being a choice between the contracting parties, the trust could be directed towards the automated system taking care of transgressions. This was countered by noting that this would be the case only in such cases where one could freely choose to be a part of such a system, choose to trust a system, whereas the whole point of Zuboff’s article is the fact that we are given no such choice in the surveillance capitalism. If we cannot choose to not belong in a system, trust becomes irrelevant. Instead there will be an unwitting confidence to the surveillance system that involves coercion – with very low odds on awareness of, and action against, this coercion. As is typical for TSElosophers, the discussion flowed intensively and in many directions, some merely loosely connected to the discussion in the article. We again worried about the environmental future of the globe, however also noted that ultimately we humans cannot destroy the globe and life in entirety, only human life and the currently evolved species – give it a few million years and the globe with new sets of life will have bounced back. However, the justification of worrying about, for instance, the quickly declining biodiversity was warranted by the ethical point of view that we humans – while having the powers due our un-ecological life-style – have no right to damage life on our lonely planet to the extent that is now happening. All in all, the article triggered interesting thoughts and invigorating discussion, and as such, it is a warmly recommended read to anyone interested in gaining one possible comprehensive interpretation of the impact of the current technological advances on the society. TSElosophers meeting 30.1.2019. Kari Lukka and Otto Rosendahl. Alvesson, M., & Spicer, A. (2012). 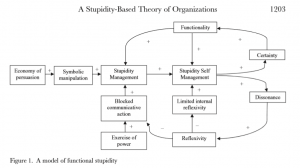 A stupidity‐based theory of organizations. Journal of management studies, 49(7), 1194-1220. This time TSElosophers discussed the article by Mats Alvesson & Andrew Spicer entitled “A Stupidity-Based Theory of Organizations”, published in Journal of Management Studies in 2012. In brief, this article introduces the notion of “functional stupidity” to complement the earlier understanding of the limitations of rationality in decision-making and action in organizations. Alvesson & Spicer particularly stress how functional stupidity adds to this by including affects and power issues into the picture. Functional stupidity is defined as “an absence of reflexivity, a refusal to use intellectual capacities in other than myopic ways, and avoidance of justifications”. The system dynamics of the model were only preliminarily discussed. Future research suggestions reflect the work-in-progress: authors suggest studies on functional stupidity evolving over time and individual’s stupidity self-management process towards greater/lesser reflexivity. This future research adds the idea of delay to system dynamic model. An interesting point of delay is between “reflexivity” and “limited internal reflexivity”. For example, organizations that curb stupidity management might expect a considerable delay before individuals start to demonstrate greater reflexivity. TSElosophers were not entirely convinced of the analytical originality or strength of the article. Firstly, the difference from the already recognized forms of limitations to rationality in decision-making, taken the latter as a whole, does not seem that big. Secondly, the article does not develop the aspects that are claimed to make the major differences, i.e. affects and power issues, to any notable depth. Thirdly, there is much similarity between the notion of “functional stupidity” and that of “action rationality” of Nils Brunsson, introduced in his article in Journal of Management Studies in 1982 and his book from 1985. Both of these mean essentially wiping aside time-consuming and complicating reflection and profound analysis in order to get ahead in action and to get something done. TSElosophers speculated about three archetypes of organizational participants with a view of functional stupidity. One of them sees through the system and, stressing the need to reflect and to offer justifications that are defendable in the long-term, takes distance to functional stupidity, even being active in counter-acting it. This may of course lead also to just cynicism or even leaving the organization. A second archetype would basically hold similar core views, but also appreciates the upsides of functional stupidity and therefore keeps normally low profile regarding countering its mechanisms. However, people representing this second archetype may still selectively choose to also resist functional stupidity, when they view resisting more necessary or beneficial than just accepting it. The third archetype refers to organizational participants who either very much buy the upsides of functional stupidity and therefore dismiss the downsides or do not recognize functional stupidity at all, but only behave in the organizational life as functional stupidity suggests/requires. TSElosophers generally found this article interesting and inspiring. The buzzword at the heart of it is striking enough to raise immediate attention – especially as it seems to include an oxymoron: How can stupidity be functional? The article is pretty compelling regarding the argument that such functional stupidity can indeed have many “positive effects” regarding the smooth functioning of organizations, and that without it, managing modern organizations would be cumbersome. To some extent the article also deals with the other side of the coin: Stupidity, even with such streamlining and simplifying functionalities as depicted in the article, has also downsides. However, it is somewhat surprising – from researchers that are known of their critical approach – how much the article stresses the “positive effects” of stupidity, making the article notably more (short-term) managerially than critically tuned. This is in some contrast to the book on a similar theme by the same authors from 2016, titled “The stupidity paradox” (Profile Books). The book is much more balanced with a view of the upsides and downsides of functional stupidity. Professor Philippe Descola, an anthropologist, motivates his book “Beyond Nature and Culture” (2013) with no less than saving the scientific field of anthropology. He is worried that of among the “modes of identification” – referring to the ways we essentially conceptualize ourselves – what he calls “naturalism” dominates the scene, both unnecessarily and with some highly problematic consequences. Drawing on anthropological findings and his own reasoning, he suggests a two-by-two matrix with four modes of identification. The dimensions of the matrix deal with whether living things (plants, animals and humans) practice continuity or discontinuity regarding their spiritual or physical self. Physical continuity refers to thinking where the various forms of living things are physically connected by their evolution, exemplified by Darwinism. Discontinuity in this regard can be exemplified by creationism, typical of Christian religion. Spiritual continuity again refers to thinking according to which the various forms of living things are spiritually connected – while they look physically different, they all represent some common spirit of life. Discontinuity in this regard means thinking where different forms of living have a hierarchy. This can be exemplified by the nowadays typical take in the Western societies where us humans are staged as the ‘kings and rulers’ of the universe: As they are viewed (by us humans!) as mentally much more developed than other living creatures (animals and plants), we kind of self-evidently should gain this special position. From Descola’s book, TSElosophers focused on reading and discussing just two cells of the matrix: Naturalism (physical continuity combined with spiritual discontinuity) and animism (spiritual continuity combined with physical discontinuity). Descola argues that only one mode of identification, naturalism, is needed to understand the majority of practices in our modernist Western-based societies. Physical continuity is strongly manifested in our wide-spread acknowledgement that humans have developed from other species through evolution. On the other hand, the same modernism also encourages us to perceive all other living things (animals and plants) as separated and (at least implicitly) inferior to us – consider the wide acceptance and consumption of industrialized meat products. Animism that has been encountered in many anthropological studies among indigenous cultures is a logical counterpoint of naturalism as it combines spiritual continuity with physical discontinuity. In animist thought, just like humans, also animals and plants form communities. For example, animistic cultures have beliefs about peccaries making beer from maize and “jaguars [that] take their prey home for their wives to cook” (Descola 2013, 132). Also, the boundaries between human, animal and plant communities are limited by different physical constitutions, e.g. peccaries form human communities with other peccaries and jaguars form human communities with other jaguars. While animals, plants and humans are spiritually connected, only in special circumstances, such as dreams, they can visit their different physical domains. As for humans, for instance, only shamans have the capability to transcend the physical boundary and visit animal and plant communities. Naturalism and animism produce different answers of the importance of humans. Naturalism emphasizes the superior intelligence and self-reflective capabilities of humans, which also imply a demand for a greater sense of responsibility from them – most often towards other human individuals. Pragmatic approaches to extend ethics beyond humanism focus on expanding the category of humans towards human-like beneficiaries. The reference point for ethics is hence always the humans. For Example, Peter Singer’s extensionist ethics considers all creatures that feel pleasure and pain as inherently valuable, while others can be treated just as objects of our observation or consumption. Any form of ethics in naturalism-dominated cultures is limited by the need to draw a boundary that spiritually severs a human individual from the majority of existence. In contrast, according to animism, all different physical forms of living are to be dealt in essentially equal terms, due to the spiritual union of all living things. Therefore, animism imbues, for instance, to humans with a desire to create intricate relations with a wide-range of communities: humans, animals and plants. Descola’s analysis is intended to shake the dominance of naturalism in our culture. It makes us profoundly understand how the Western modernist practice of life, staging humans into the ‘superior position’, has led us to see the rest of the world as just objects serving our desires – essentially just potential resources for our production and consumption. Having read Descola, we became increasingly worried by the strongly expansionist drive in naturalism. Our key concern with naturalism is the deeply institutionalized and therefore taken-for-granted competition and consumption of resources, where the expansionist drive is out-reaching our planetary limits. For us, the key ideas of animism, where all living things should be treated with appreciation, all being our ‘brothers and sisters or cousins’ in their spirit offers a fundamentally different and at least thought-provoking approach to our practices of living. Such way of thought would immediately question the ethical grounding of our expansionist way of life, being based on the belief of ever-increasing growth of production and consumption, which is effectively just using the other living things as we please as resources at our disposal. Spiritual continuity in animism perceives its kin as successfully expanded into the world without any requirement of competition, conquest or status. On a final note, we are not sure why Descola motivated his research with the aim of saving anthropology. Descola referred to a wide range of anthropological research, which indicates that there are not any serious crises in their credibility. Possibly Descola’s theoretical efforts are pre-emptive: They certainly help to align anthropology better with post-humanistic philosophies. In summary, we believe that anthropological insights have potential to inspire us and develop our imagination in the development and adoption of practices regarding our society’s most pressing misgivings, such as our on-going contradiction between ecology and expansion. What is the key point the author wishes to make with the book? We deduced that his main statement is that paying ones’ debt is not always the most moral choice, as there can be circumstances where this commonsensical notion actually causes more harm than good. How can the boundaries between when it is, and when it isn’t “right” to pay debts be drawn? The benefits of debt: debt as an investment implies a faith in a better future. The necessity of this faith in the future – do we need the sentiment of going forward, towards “more”, or is this linear notion of time one root cause of the environmental problems we are facing (considering the finite nature of our planet)? In the book, concerned about the power of debt to cause inhuman, immoral consequences to debtors (including examples of daughters being sent to prostitution, or people dying in thousands in developing countries as IMF and other creditors have demanded their debts to be repaid) Graeber asks whether it really is so that debts always need to be paid back? To this end, he trails the historical development of credit. In chapter 2, he reviews the history of money and debt told today in economics’ textbooks. This story goes that first there was barter; then currency or money was developed to ease the economic exchange of stuff; and, later on, credit developed. By juxtaposing the story with anthropological evidence, he concludes that the now common narrative in economics is wrong. Actually, the opposite is true: the order would actually be that credit developed first, and from it, money. Barter in turn has never been a wider-scale social practice. He claims that only by introduction of money and interest rates did credit become decoupled from considerations of the needs and situations of all involved: what started out as a simple trust-based I-owe-you that helped people to rely on each other in circumstances where someone had a surplus at anothers’ time of need and vice versa, became an industry in itself. The focus shifted to numbers that do not heed the real life circumstances: when trust between the debtor and debtee was removed and interest rates introduced, debt took on a life of its own. He argues that our confusion of debt as a moral duty is just that – a confusion, and that not all debts need necessarily to be paid back. On the way, he also argues that it was the economics’ story of development of money, and credit that allowed markets and monetary credit to be artificially disentangled from other social institutions and phenomena. This is because the story makes the development of currency and ensuing monetary credit seem like natural, good solutions to practical problems involved in barter, that all of humanity would have done earlier. This would have entailed the understanding that these institutions are natural, somehow, they need to be maintained by police force and law, and that they can be detached from considerations of other aspects of life and morality. This would, in turn, make these institutions further inhumane supporting the idea that debts need to be paid back unconditionally. The chapter and the book elicited discussion on several tangential topics. We discussed that credit seems to have positive aspects to it. We considered that Graeber did not give a balanced handling to the issue of debt. He concentrated on the immorality in debt relationships, although monetary debt may also lead to beneficial outcomes. For example, it (1) enables transition of wealth from where it is in excess to where it is scarce; and (2) it enables people to initiate projects that would otherwise be beyond their reach financially. However, Thomas Piketty’s finding in his book “Capital in the Twenty-First Century” (2014) that returns on capital grow faster than returns on labor seems to pose the question that is the function (1) illusionary? We hypothesized that the transition from a cyclic experience of time to a linear time likely relates to the appearance of monetized, interest-growing credit. There was controversy over what came first: the need to enhance future or monetized, interest-growing credit. It might also be that before monetized credit people got from neighbors what they needed as a kind of a gift and when their neighbors were in need they would reciprocally give what the neighbors needed – and only with the appearance of monetized credit would also the idea of enhancing future, and of linear, progressive time, appear. However, never mind the order, the notions of linear time and the “better” tomorrow seem to be linked. Graeber’s book inspired us to discuss the relation between markets and well-being. From the anthropological evidence and discussion on alternative distribution and production mechanisms, arose the topic of what are the limits of markets to yield well-being. As Graeber observes, more intimate, familial, “warm” relationships between people do involve exchange of services and goods; but not through money. contemporary attempts to commodify well-being into salable services: by replacing social relationships with money, also the main component of value in such services, namely the exact social relationships, disappear. see that the human impact on some of the boundaries of our planet are already threatening our existence? But if we lose the faith in the always better tomorrow in aligning collective action to pursue that better tomorrow, how can we replace that as an enabler of collective action? We need to find alternative coordination mechanisms for our societies. ones’ debt as it indeed seems that there are cases when paying back the debt is not the “right” thing to do, no matter how counter-intuitive that for a contemporary member of the current socio-economic system may seem. In his book “Pragmatism and Organization Studies”, Philippe Lorino (2018) introduces Peircean pragmatism as a position against mainstream representationalism in organizational studies. Representationalism assumes the semiotics of signifier/signified as a dyad, which leads to representation/reality dichotomy. In contrast, Peirce’s semiotics introduces situational perspectives as “interpretants” that dilute the accuracy of any signifiers to “a representamen” (a specimen among others). To put it differently, pragmatism relegates representations to a situational resource among other resources, whereas representationalism claims that “representation determines action; it is the source of action” (Lorino 2018, 33). Lorino credibly uses the early pragmatist concepts to challenge representationalism. However, many other process philosophies have already highlighted challenges to representationalism – also based on other streams of the philosophy of science – in mainstream organizational studies. For example, pragmatism can be viewed generally as aligned with the practice turn in social ontology (Friedrichs & Kratochwil 2009, 713) and the developments in process philosophy (Rescher 1996) are already somewhat reflected in organizational studies, e.g. in strategy-as-a-practice (Vaara and Whittington 2012). One of the issues discussed in this context was the flattening of history by Lorino – as he was at the same time drawing from the “old” pragmatists and the subsequent developments seeded by them, some of the insights that may have been revolutionary (and expressed as such by Lorino) do not seem quite as foreign to the contemporary reader familiar with the subsequent developments as Lorino emphasizes. Lorino’s (2018) book sparked a lively discussion whether correspondence theory of truth is relevant or irrelevant for pragmatism. Pragmatists emphasize consensus theory on knowledge, but it seems that correspondence theory within the framework of consensus is not necessarily excluded. For Peirce, the main force that creates order and stability in the universal process comes from relational ‘attraction’ (Ormerod 2006), which is difficult to define narrowly. For example, a strong consensus of knowledge is achieved by the imminent destruction of the Earth by an asteroid in Trier’s film Melancholia (see Ch1, Zizek 2014). In Melancholia, the everyday attraction towards vitality changed to the overbearing attraction to heavenly bodies and horror. The consensus became formed without any credible claims to socially constructing of some other kind of reality; there was a strong convergence towards a singular understanding of reality in the context shown us by Trier – and the convergence of views in such a situation may well be in line with representatiolist correspondence. We also discussed the Peircean “thirdness” in regards to the correspondence theory of the truth. The significant semiotic contribution of Peirce was to highlight the third element relevant in a concept: whereas de Saussure broke the concept into two components of the signifier (the word tree) and the signified (the thing growing from the ground, referred to with the word), Peirce introduced the importance of the interpretant (the one doing the referring to the tree, nuanced by the understanding of the tree by the utterer). In our discussions we pondered that in pragmatism, the correspondence does not necessarily flow in between the signified and the signifier, but is instead located in between the interpretant and the signified – for the one interpreting the growing thing as something that can be referred to as a tree, the uttering corresponds with the contextually created notion of truth. The example found in Lorino’s text about a group of piqueniquers highlights this: in viewing a flat stone it is referred to as a table. In the context of having outdoors lunch the interpretation of stone as a table is true, even though without the context a flat stone does not correspond with the general meaning of the word table. Regarding scholarly research, Peircean pragmatists are bound to recognize the attraction of correspondence theory. In particular, it has (arguably to remarkable extent) produced beneficial results in (natural) sciences. Lorino (2018, 264) sums up the union of Peircean pragmatism with correspondence as follows: “Science would rather appear as an attempt to formulate beliefs […] in the effectiveness of action – for example, does the management of nuclear safety really avoid major accidents (and this “really” means something here)?” As pragmatists see the employment of the correspondence of theory of truth having less application options than realists, pragmatists focus on the development of useful beliefs instead of bare facts. Although this formulation seems to gnaw the foundation of a scientific worldview, it could be also understood positively: pragmatism potentially extends the scope of science. The scientific foundation of facts as ‘well-justified true beliefs’ are not completely taken away, but rather they are complemented with the consideration that facts are produced in a range of different situations and perspectives. Fact claims are also employed in relatively sinister occurrences, e.g. for manipulation and for adopting superiority. In sum, “humans do not have doors and windows open to the world: they are in the world; they even are the world (Lorino 2018, 40).” We discussed along the lines of this pragmatist proclamation, especially concerning the human capabilities for connecting with their world. Anthropological studies from non-western cultures illustrate that humans have great potential for a thorough connectedness (Descola 2013). Unfortunately, the connectedness in western culture is often visible only in material terms (Descola 2013): We generally believe that humans have become a relatively advanced instantiation of animal evolution. Spiritual connectedness, however, would mean further avoidance to dichotomize man and nature. Regrettably the attraction towards one dichotomy allies itself often with others, e.g. reality/representation, human/natural and beneficiary/resource and representations on reality are typically used to exploit natural resources for human beneficiaries. These dichotomies come with implicit justifications of human beneficiaries’ superiority. With these dichotomies, it becomes practical and natural to neglect non-human beneficiaries, as well as those humans considered merely as “resources”. TSElosophers support scientific practices that emphasize developing everyone’s sensitivity and respect for their world in a holistic sense. Pragmatism offers one potential starting point in this regard, but also it would need widening of scope to be more helpful in the development of beliefs that would genuinely take into consideration the huge social and ecological challenges of our time and the near future. “Anti-Oedipus: Capitalism and Schizophrenia” (Deleuze & Guattari 1977) is a book that needs to be understood in its historical context. Lyotard, Baudrillard and Irigaray had just published books that strongly challenged scientifically rationalistic foundations. Guattari was a creative psychologist, who felt that psychoanalytical tradition of that time was too constraining. Deleuze was the philosopher who wrote down and refined Guattari’s abstractions. Their co-operation produced one of the most complex scholarly best-sellers of all times. The book starts with building a distinctive and peculiar non-humanistic ontology in order to criticize psychoanalytical practices of their time. A paradigmatic role is given to the unconscious production of “desiring-machines” – a notion that lies at the heart of the book. All desiring-machines are a fleeting part of the universal schizophrenic flow, which they occasionally arrest with neurosis and perversions. Neuroses refer to holding on to one form and perversions to creating a multitude of forms, for example DNA reproduction or DNA mutations. D&G present capitalism as a (phenomenological) social machine that feeds the desiring-machines and continuously increases their schizophrenic, neurotic and perverse productions. Capitalism differs from territorial and despotic machines, because it runs with an abstract code, i.e. money, which compels increasing desire-production as its requirements develop more flexibly. For example, capitalism provides ample opportunities for thrilling, enjoyable or comforting schizophrenic escapes with experiential consumption, impulsive shopping and social media. Especially social media provides easy and gratifying targets for both neurotic interventions and perverse interpretations, often against the public displays of schizophrenic production. Consider the public outrage that resulted from a Facebook picture of a 12-year old American girl standing victoriously beside a giraffe she had hunted down. D&G’s method is aimed against preconscious interests of social machines, which repress desiring-machines to celibacy. Celibate joys and sorrows are very real, but neurotically determined by success in producing intensifying quantities in alignment with the social code. An uncommon celibate alternative for quantity production is schizoid thinking: artificial balancing of joys and sorrows (authors suggest Kant as an example). However, D&G’s ontology highlight that even abandoning the “miraculating” social machine does not lead to a discovery of a true miracle machines. Rather, it leads to the production of intensifying abstractions and feelings. Many pitfalls for production disorders wait there as well, such as paranoiac, borderline and histrionic. The last is exemplified by Nietzsche who thought “everything is part of I”, in contrast to D&G’s ontology that posits conscious subject as an insignificant by-product of desiring-machines. One of the beginning statements that “desiring-machines work only when they break down, and by continually breaking down” (p. 8) slowly starts to make sense. The book is refreshingly outspoken by assigning us all with varying level of mental disorders (whether one is successful or unsuccessful in the production of quantities) and thereby succeeds in alleviating the (phenomenological) external neurotic pressures. For example, Freud’s psychoanalysis was commonly used in the 70’s as a celibacy-inducing mechanism that narrated all problems with childhood and the aim of the treatments were to get people back to producing intensifying quantities. In contrast, Guattari encouraged his patients – a word he detested – to play different games, which let them some detachment from preconscious interests, and attach to and be guided by their unconscious desire-production. We discussed whether D&G are for or against capitalism. They outline that capitalism compellingly moves towards cosmic death (note: our interpretation to “body without objects”) with intensification of abstract quantities. However, they elaborate few details how to avoid it. Perhaps human consciousness may/should strive, although its ability to do so is strongly questioned, to steer production from the deleterious effects of producing intensive quantities towards well-selected production of intensifying feelings and abstractions. Perhaps consciousness is not able to do better than listen music on the deck chairs of Titanic, because the ice berg cannot be avoided. Accelerationists even argue that why try to turn the ship instead of colliding to ice berg directly. We concluded that the early parts of the book are more descriptive, but that it gains more normative overtones for the schizophrenic escape with the presentation of their method: schizoanalysis. However, later Deleuze and Guattari clarified that they do not want to speak about schizoanalysis in order not to promote schizophrenic escapes. Hopefully, the combination of desiring machine production could help to create and upkeep influential virtuous abstractions – that are sometimes aligned with and sometimes against the prevailing social machine. For example, the clairvoyance brought by a schizophrenic escape, the neurosis that demands the righteous hero to continue and the perversion that saves the day. This time the TSElosophers read four articles discussing the issue of performativity of theories from two philosophically different vantages. As such, the quartet of articles provided not only ample insights into the issue itself, but highlighted also the impact and importance of the underpinnings we ground our thinking on, and the lenses through which we view whatever it is we’re thinking about. To begin with, in their 2005 article, Ferraro, Pfeffer and Sutton (hereafter FPS) addressed the potential embedded in even (by some definition) false theories to shape the external world in ways that make the theories self-fulfilling prophesies; the performativity of the theories. The focus was especially on the impact of economic theories (and their underlying assumptions) on the subsequently emerging behavior of the economic agents because of the society shaping (political) power that economics currently wields. As an example, they discuss how Black-Scholes formula for predicting stock prices that economics developed in the 1970’s, only started working properly after the practitioners started using the Black-Scholes formula as a rule of thumb in their daily trading operations. Ultimately, FPS identify three mechanisms to make performativity happen: institutional design, norms and language. In essence, they question to what extent people have become the agents described by the economic theories because of the performativity of those theories. And furthermore, to what extent is it the responsibility of us scholars to fashion and frame our theories in a way that promotes a constructive form of practitioner reflectivity – rather than for example simplistically reducing the historically multifaceted (e.g. Adam Smith, Theory of Moral Sentiments) concept of self-interest to its dimensions that promote human selfishness to an unruly degree? The first article by Felin and Foss (hereafter FF) engaged the FPS article in a debate from the perspective of economists: firstly they stated that as the more sociologically oriented organization theorists and economists seldom discuss in the same arena, it is pertinent to raise to the defense of the validity of economics. Secondly, and more poignantly, they pointed out that it is necessary to explore the boundary conditions of when can (and do) the theories become performative, and suggested that only the theories that are more “true” can become such. The main example here was hyperrationality: as one strawman of economic theories posits that humans are self-interest seeking and hyperrational, the reason why the first can be perceived as performative is because it’s possible, whereas becoming hyperrational is impossible – no performativity can change that. Overall, FF insist for a ‘reality check’ for performativity arguments. In the ensuing retort by FPS, they addressed the weaker arguments of FF through enlisting a plethora of sociological and philosophical performativity discussions, in addition to picking apart the example of incentives introduced by FF: turned out that the application of incentives in the firm in question had actually resulted in less than ideal performance. Subsequently, in the final response of FF, they outright addressed the different philosophical underpinnings of FPS, blaming them for the sin of being on the wrong side of the realist-constructionist debate, and as such undermining the whole validity of science as an endeavor to uncover extant realities. This final sentiment in the last paper by FF recapitulated the underlying tensions of the discussion aptly: if science is indeed about following the correspondence theory of truth, with the assumption of there being a stable reality with scientific progress approached (the viewpoint of FF), taking into account the ability of the humans to reflect and by reflection change their actions constituting the reality (in contrast with the objects of the natural sciences lacking the ability to reflect and by reflection change) does threaten the assumption of the stability of the underlying (social) reality. On the other hand, focusing only on the agentic powers of the individuals and collectives to construct and shape the social reality (for example by performative theories, as FPS suggest), the correspondence theory of truth is hard to apply, as there simply isn’t a stable reality to which a theory could correspond. The question that FF then ask is, does this mean that anything goes, are there no solid boundaries for our theorizing? To sum, the debate captured a fundamental arguing point is social sciences: are there solid underlying realities that shape and bind the social reality, or are all perceivable social realities just about the phenomenologically flowing chaos we at times structure through language, the actions of the individual agents and collectively emergent social forces and practices? This series of articles struck a resonating chord in the TSElosophers, as one of the enduring streams of our conversations has been the need to embrace the potential of both realist and constructionist approaches. We see value in understanding the power of social construction and in assessing the potential existence of something somehow definable as “real” – expressed in the call for approaches where moderate constructionism meets moderate realism, heeded with pragmatism in accounting and international relations, and with critical realism in international business and information systems, to name few examples. In regards to the four papers, we deemed it valuable to both acknowledge the performative potential of theories, especially as accompanied with a sense of societal responsibility, and to critically analyze the boundary conditions that define that potential. Why and how do some theories realize that potential of performativity? However, while both sets of viewpoints and resulting views were eloquently expressed in the papers, we lamented the fact that both approaches were too firmly entrenched in the opposing philosophical trenches – like in the famous ‘Science Wars’ of the 1990s – to actually enable the debate to rise above the battle field in a joint effort of solving the puzzle of performativity. We thought that the four articles highlighted the issue of performativity from several angles, and that without the underlying battle field, the joint effort of these brilliant minds could have resulted in a genuinely relevant understanding of the focal questions about the boundary conditions, potential scope, and mechanisms of performativity. As things now stood, the need of the authors to stand their respective philosophical grounds dominated with the result of select insightful seeds meticulously sown but not cultivated to bear fruit. Maybe we in TSElosophers should nurture these seedlings further…? Ethical ascetic practices – or how to resist as an underdog? The article by Munro (2014) discusses Foucauldian ‘art of living’ in organizational practice, specifically in social movement organizations (SMOs). Art of living focuses on self-creation, which goes beyond “exploitative neoliberal mechanisms of identity formation” (Munro 2014, 1128). According to Munro, neoliberal discourse reduces the self to a machine that produces, including the production of satisfaction with consumption. SMOs often act to balance the excesses of neoliberalism, which means that the art of living is more pervasive in this context. Munro (2014, 1142) points out that “SMOs provide a rich source of possibility for the development of alternative ethical exercises as well as opening up tactical points of reversibility to dominant neoliberal forms of subjectivity”. SMOs mentioned in the article include Amnesty Intl, Greenpeace, Methodism, Quakerism, Occupy movement and Slow Food. Munro discovers four organizational practices relating to ‘ethical askesis’: Bearing witness, direct action to create alternatives, care for self, and the use of pleasure. Bearing witness refers to finding ‘the truth’ and experiencing its injustice and oppression, e.g. Greenpeace sailing a boat to nuclear test zone. Direct action stresses the creation and enaction of alternatives. For example, having dumped a ton of dead fish in front of a pulp industry company (i.e. bearing witness with a public dimension), Greenpeace helped the pulp industry to gather actors together to create less chloride-intensive solutions for bleaching paper (Håkansson, Gadde, Snehota & Waluszewski 2009, 49–61). The practice of care for the self is founded upon self-denial and personal sacrifice. This practice is legitimized by comparing it to the suffering of people that SMO members are trying to help, e.g. the Occupy movement’s meager protesting conditions reflects solidarity for the less fortunate. Nevertheless, the ethical ascetic practices also include the uses of pleasure that contrasts with pervasive neo-liberalistic institutions, e.g. adhering to slow food instead of fast food traditions. The discussion at the meeting of TSElophers dug deeper into the unit of analysis in the article: It seemed that the levels of the individual and of the organization (here SMO) were conflated towards the latter part of the article. It seemed that Munro metaphorically endowed the SMOs the role of Diogenes the cynic, in which case the revealed ascetic practices did indeed signal resistance towards the wider structures in which that agent is embedded. However, if we look at the individuals within the SMOs, the logic doesn’t hold, as the individuals within the SMOs do not resist their organizations (the SMOs), but conform in order for the SMO to do the resistance. That said, we also deemed that as the article leaned more towards a desire to trigger thoughts and discussions than towards an attempt to deliver crystallized conceptualizations, this blurring of the analytical levels – while it led the group to ponder some issues of academic rigour – did not significantly diminish the merits of the article in terms of identifying modes of resistance. Munro posits that art of living requires self-mastery, which enables reversal of the relationship to an external power. According to Foucault (2005, 252; in Munro 2014, 1134–1135), ”there is no first or final point of resistance to political power other than the relationship one has to oneself”. However, this asketic self-mastery is understood differently by Stoic and Cynic ethics. Stoics established a wider perspective, where askesis translates into mastering others through the mastery of oneself. Hence this type of askesis can arguably be connected to the development of capitalistic institutions. However, Cynics adopted an underdog perspective according to which self-mastery should be used ”as an act of permanent critique of the prevailing social order”. The Foucauldian concept of ethical askesis builds on the latter definition. In sum, the ethicality of askesis for Foucault concerns the practices that aim to transform institutionalized values. This led the TSElosophers to ponder the potential modes of resistance we could engage in, if the structures resisted were to consist of, for instance, the publish-or-perish mentality often mentioned in our conversations. It was pointed out that criticizing can also be an act of validation, as both conforming to and criticizing the structures render them more visible and thereby increasingly ‘real’. Another way of rebelling against the structures is to disengage from the boundaries they suggest, by aligning ones actions towards other goals than the ones validated through conforming or criticizing. TSElosophers club in itself could be described as a form of direct action that supports alternative research approaches, stressing the meaningfulness of scholarly work beyond the boundaries of whether something is publishable or not. However, art of living with non-mainstream approaches involves developing one’s abilities in caring for the self as securing just the basic income for living becomes more challenging. Engaging in acts of resistance from the (relative) security of a professorial position is different than resisting the structures from the position of a doctoral candidate dependent on grants. However, we all agreed that while the acts in themselves may differ, resisting – or at the very least, reflecting on one’s own ethical acts – is possible no matter the position. In regards to for example our university, we also discussed that an ethical asketic could engage in ‘tests’ whether the institutionalized structures live up to their expressed and/or assumed ideals. For example, the expressed ideals of University of Turku are ethicality, criticality, creativity, openness and communality (University Strategy 2016–2020). While everyone recognizes that not all of these ideals are fulfilled, ethical asketism would highlight engaging into the development of alternative solutions – and possibly defending these with explicit references to the organization’s expressed ideals. The insights delivered by Munro in the article may provide ways to think about how to go about this in practice: How would the ethical askesis of bearing witness, direct action, caring for self and using pleasure look like when transformed into practices in our setting?